In 1914, the late Bruce Drysdale visited the mountains of Western North Carolina as a young man and immediately fell in love with this part of the country. He had some knowledge of clays and foresaw a tremendous potential for the brick industry in the area. Drysdale started manufacturing brick in Etowah. Brick manufacturing continued until the early 1950s, when the operation was moved to Fletcher, North Carolina. One needs only to dig a post hole on the property to be aware of the millions of bricks produced at Etowah. Unfortunately, the land at Etowah had become severely battered and scarred. 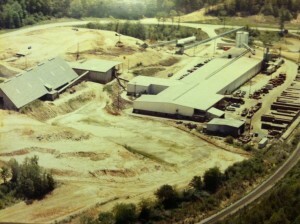 In gratitude to the old employees who remained loyal to him over many years, Drysdale in 1964 decided to reclaim the mutilated mining lands at Etowah and constructed a championship golf course on that site which could, in turn, reward his old employees who owned most of the surrounding land. Etowah Valley Golf & Resort was constructed on the former plant site of the Moland-Drysdale Corporation in 1964. Moland-Drysdale manufactured the area’s famous Etowah Brick, which was shipped throughout the eastern half of the United States. Drysdale never saw the fruition of the golf course that changed the town of Etowah from barron industrial site to a vacation and residential community. Drysdale died the day the final survey for the golf course was completed. The services of the famed golf course architect, Edmund B. Ault of Silver Spring, Maryland, were obtained and construction began December 4, 1964. Ault envisioned creating one of the best golf courses in North Carolina, and the course opened for play on July 8, 1967 after being purchased by the Todd family. Etowah Valley Golf Course was the first course in Western North Carolina to have fully irrigated fairways and the first course in Western North Carolina to have paved cart paths throughout the entire length of the course. A modern clubhouse was completed in 1969, housing the proshop, snack bar and both men’s and women’s lounges. Play at the golf course was based on an annual membership fee of $25 plus daily green fees of $2.50 and $3.50 on weekends and holidays. In 1971, the course was honored by the PGA as its selection for the site of the nationally televised Kemper Satellite Tournament. In January 1987, construction began on a new nine-hole addition to the present 18-hole course. Again, Mr. Edmund B. Ault was retained to design the new addition. Beginning in May 1988, with the opening of the new nine, the Club offers three separate and challenging 18-hole combinations. The tennis facility began in 2003 with the construction of three Hydro-clay courts. Etowah Valley has a club-based team, which competes as part of the Southern USTA League. The Etowah Valley Team competes in local, regional, state and national tournaments. The Club hosts tennis events and clinics. The Etowah Area has welcomed many new friends as people retire and recognize the community as one of the most scenic, relaxing, and friendly areas of the country in which to live. Unlike most other golf areas, people find Etowah not only a great place to visit, but a place to live and love life.